Mike Bird (Canada) saw a UFO hover over Lake Ontario for over 2 hours in Sept 1975. He watched it through a telescope. His wife and parents also watched it and confirmed what he saw. He attended his first MUFON Conference in 1976 and he helped to organise the MUFON Conference in Toronto in 1982. In the early 90s he started his own UFO Discussion and Abduction Support Group. 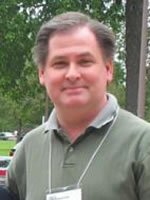 Mike has been the Regional Director for MUFON (Mutual UFO Network) Central Canada since 2002. In September 2005, he was co-organizer of the Exopolitics Toronto Symposium which featured the public emergence of former Canadian Minister of Defence, Paul Hellyer, calling for an end to the UFO cover up. Mike Bird is a member of the Advisory Board of the Exopolitics Institute, and country director for Canada, as well as a member of the Exopolitics World Network.